Cornish (Kernowek) is a revived language that became extinct as a first language in the late 18th century. It is a member of the Brittonic Southwestern branch of the Celtic languages. that was native to Cornwall in south-west England. A revival began in the early 20th century. Some have expressed the opinion that the language is an important part of Cornish identity, culture and heritage. Cornish is currently a recognised minority language under the European Charter for Regional or Minority Languages. It has a growing number of second language speakers. A few parents are inspired to create new first language speakers, by teaching their children the language from birth. Along with Welsh and Breton, Cornish is descended directly from the Common Brittonic language spoken throughout much of Britain before the English language came to dominate. It was the main language of Cornwall for centuries until it was pushed westwards by English, maintaining close links with its sister language Breton, with which it was mutually intelligible until well into the Middle Ages. Cornish continued to function as a common community language in parts of Cornwall until the late 18th century and continued to be spoken in the home by some families into the 19th century. A process to revive the language was begun in the early 20th century, with a number of orthographical systems still in use, although an attempt was made to impose a Standard Written Form in 2008. In 2010, UNESCO announced that its former classification of the language as "extinct" was "no longer accurate". Since the revival of the language, some Cornish textbooks and works of literature have been published, and an increasing number of people are studying the language. Recent developments include Cornish music, independent films and children's books, and the language is taught in schools. The first Cornish language crèche opened in 2010. Joseph Loth viewed Cornish and Breton as being two dialects of the same language, claiming that "Middle Cornish is without doubt closer to Breton as a whole than the modern Breton dialect of Quiberon [Kiberen] is to that of Saint-Pol-de-Léon [Kastell-Paol]." Cornish evolved from the Common Brittonic spoken throughout Britain south of the Firth of Forth during the British Iron Age and Roman period. As a result of westward Anglo-Saxon expansion, the Britons of the southwest were separated from those in modern-day Wales and Cumbria. Some scholars have proposed that this split took place after the Battle of Deorham in about 577. The western dialects eventually evolved into modern Welsh and the now extinct Cumbric, while Southwestern Brittonic developed into Cornish and Breton, the latter as a result of emigration to parts of the continent, known as Brittany over the following centuries. The area controlled by the southwestern Britons was progressively reduced by the expansion of Wessex over the next few centuries. During the Old Cornish period (800–1200), the Cornish-speaking area was largely coterminous with modern-day Cornwall; the region of Devon was isolated by Wessex in 936 AD and many inhabitants fled to Cornwall or Brittany. 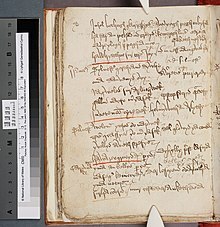 The earliest written record of the Cornish language comes from this period; a 9th-century gloss in a Latin manuscript of De Consolatione Philosophiae by Boethius, which used the words ud rocashaas. The phrase means "it [the mind] hated the gloomy places". A much more substantial survival from Old Cornish is a Cornish-Latin glossary (the Vocabularium Cornicum or Cottonian Vocabulary) containing translations of around 300 words. The manuscript was widely thought to be in Old Welsh until the 1700s when it was identified as Cornish. At this time there was still little difference between Welsh and Cornish, and even fewer differences between Cornish and Breton, with some scholars arguing that the terms "Old Cornish" and "Old Breton" are merely geographical terms for the same language. Through many factors, including loss of life and the spread of English, the Prayer Book Rebellion proved a turning-point for the Cornish language. Peter Berresford-Ellis cites the years 1550–1650 as a century of immense damage for the language, and its decline can be traced to this period. In 1680, William Scawen wrote an essay describing 16 reasons for the decline of Cornish, among them the lack of a distinctive Cornish alphabet, the loss of contact between Cornwall and Brittany, the cessation of the miracle plays, loss of records in the Civil War, lack of a Cornish bible, and immigration to Cornwall. The last native speakers of Cornish are thought to have died by the end of the 18th century. In the 18th and 19th centuries, there was academic interest in the language and in attempting to find the last speaker of Cornish. This academic interest, along with the beginning of the Celtic Revival in the late 19th century, provided the groundwork for a Cornish language revival movement. The revival entered a period of factionalism and public disputes, with each orthography attempting to push the others aside. 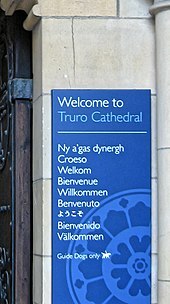 By the time that Cornish was recognised by the UK government under the European Charter for Regional or Minority Languages in 2002, it had become recognised that the existence of multiple orthographies was unsustainable with regards to using the language in education and public life, as none had achieved a wide consensus. A process of unification was set about which resulted in the creation of the public-body Cornish Language Partnership in 2005 and agreement on a Standard Written Form in 2008. In 2010 UNESCO altered its classification of Cornish, stating that its previous label of "extinct" was no longer accurate. This was seen by Cornish speakers as a milestone, turning the language from a state of undergoing revival, to having been revived. Speakers of Cornish reside primarily in Cornwall, which has a population of 563,600 (2017 estimate). There are also some speakers living outside Cornwall, particularly in the countries of the Cornish diaspora, as well as other Celtic nations. Estimates of the number of Cornish speakers vary according to the definition of being a speaker, and is difficult to accurately determine due to the individualised nature of language take-up. Nevertheless, there is recognition that the number of Cornish speakers is growing. From before the 1980s to the end of the 20th century there was a sixfold increased in the number of speakers to around 300. One figure for the mean number of people who know a few basic words, such as knowing that "Kernow" means "Cornwall", was 300,000; the same survey gave the figure of people able to have simple conversations at 3,000. The Cornish Language Strategy project commissioned research to provide quantitative and qualitative evidence for the number of Cornish speakers: due to the success of the revival project it was estimated that 2,000 people were fluent (surveyed in spring 2008), an increase from the estimated 300 people who spoke Cornish fluently suggested in a study by Kenneth MacKinnon in 2000. Jenefer Lowe of the Cornish Language Partnership said in an interview with the BBC in 2010 that there were around 300 fluent speakers. Cornwall Council estimated in 2015 that there were 300–400 fluent speakers who used the language regularly, with 5,000 people having a basic conversational ability in the language. A report on the 2011 Census published in 2013 by the Office for National Statistics placed the number of speakers at somewhere from 325 to 625 speakers. In 2017 the ONS released a freedom of information request based on the 2011 Census which placed the number of speakers at 557 people in England and Wales declared Cornish to be their main language, 464 of whom lived in Cornwall. The Institute of Cornish Studies at the University of Exeter is working with the Cornish Language Partnership to study the Cornish language revival of the 20th Century, including the growth in number of speakers. Cornish has no official status anywhere but, since 2002, it has been recognised as a minority language under the European Charter for Regional or Minority Languages. The Cornish Language Partnership promotes and develops the language in Cornwall. Cornwall Council's policy is to support the language, in line with the European Charter. A motion was passed in November 2009 in which the council promoted the inclusion of Cornish, as appropriate and where possible, in council publications and on signs. This plan has drawn some criticism. In October 2015, Cornwall Council announced that staff would be encouraged to use "basic words and phrases" in Cornish when dealing with the public. In 2014 the Cornish people were recognised by the UK Government as a national minority under the Framework Convention for the Protection of National Minorities. The FCNM provides certain rights and protections to a national minority with regard to their minority language. UNESCO's Atlas of World Languages classifies Cornish as "critically endangered". UNESCO has said that a previous classification of "extinct", which came under fierce criticism from Cornish speakers, "does not reflect the current situation for Cornish". In 2016, British government funding for the Cornish language ceased, and responsibility transferred to Cornwall council. In contrast, Cornish translates the English noun, "book", as lyver (= Welsh llyfr), but lyver can actually be translated into English as "book" or "volume" because it can be considered one in a set of books. No indefinite article. Porth means "harbour" or "a harbour" (there is, however, a definite article: an porth means "the harbour"). According to sociolinguist Kenneth MacKinnon, Jenner wrote "There has never been a time when there has been no person in Cornwall without a knowledge of the Cornish language." Cornish has significantly and durably affected Cornwall's place-names, as well as in Cornish surnames, and knowledge of the language helps the understanding of these ancient meanings. Cornish names are adopted for children, pets, houses and boats. The Celtic Congress and Celtic League are groups that advocate cooperation amongst the Celtic Nations in order to protect and promote Celtic languages and cultures, thus working in the interests of the Cornish language. Cornish has significantly and durably affected Cornwall's place-names, as well as in Cornish surnames, and knowledge of the language helps the understanding of these ancient meanings. Cornish names are adopted for children, pets, houses and boats. There are periodicals solely in the language such as the monthly An Gannas, An Gowsva, and An Garrick. BBC Radio Cornwall has a news broadcast in Cornish, and sometimes has other programmes and features for learners and enthusiasts. Local newspapers such as the Western Morning News have articles in Cornish, and newspapers such as The Packet, The West Briton and The Cornishman have also been known to have Cornish features. The language has financial sponsorship from sources, including the Millennium Commission. A number of language organisations exist in Cornwall: Agan Tavas (Our Language), the Cornish sub-group of the European Bureau for Lesser-Used Languages, Gorsedh Kernow, Kesva an Taves Kernewek (the Cornish Language Board) and Kowethas an Yeth Kernewek (the Cornish Language Fellowship). Cornish is taught in some schools; it was previously taught at degree level at the University of Wales, though the only existing course in the language at University level is as part of a course in Cornish Studies at the University of Exeter. In March 2008, a course in the language was started as part of the Celtic Studies curriculum at the University of Vienna, Austria. The University of Cambridge offers courses in Cornish through its John Trim Resources Centre, which is part of its Language Centre. In addition, the Department of Anglo-Saxon, Norse and Celtic (which is part of the faculty of English), also carries out research into the Cornish language. In 2015 a university level course aiming to encourage and support practitioners working with young children to introduce the Cornish language into their settings was launched. The Cornish Language Practice Project (Early Years) is a level 4 course approved by Plymouth University and run at Cornwall College. The course is not a Cornish language course, but students will be assessed on their ability to use the Cornish language constructively in their work with young children. The course will cover such topics as Understanding Bilingualism, Creating Resources and Integrating Language and Play, but the focus of the language provision will be on Cornish. A non-accredited specialist Cornish language course has been developed to run alongside the level 4 course for those who prefer tutor support to learn the language or develop their skills further for use with young children. Classes and conversation groups for adults are available at several locations in Cornwall, as well as in London, Cardiff and Bristol. John Whitaker, the Manchester-born rector of Ruan Lanihorne, studied the decline of the Cornish language. In his 1804 work the Ancient Cathedral of Cornwall he concluded that: "[T]he English Liturgy, was not desired by the Cornish, but forced upon them by the tyranny of England, at a time when the English language was yet unknown in Cornwall. This act of tyranny was at once gross barbarity to the Cornish people, and a death blow to the Cornish language." Robert Williams published the first comprehensive Cornish dictionary in 1865, the Lexicon Cornu-Britannicum. As a result of the discovery of additional ancient Cornish manuscripts, 2000 new words were added to the vocabulary by Whitley Stokes in A Cornish Glossary. William C. Borlase published Proverbs and Rhymes in Cornish in 1866 while A Glossary of Cornish Names was produced by John Bannister in the same year. Frederick Jago published his English–Cornish Dictionary in 1882. In 1981, the Breton library Preder edited Passyon agan arluth (Passion of our lord), a 15th-century Cornish poem. The first complete translation of the Bible into Cornish, translated from English, was published in 2011. Another Bible translation project translating from original languages is underway. The New Testament and Psalms were posted on-line on YouVersion (Bible.com) and Bibles.org in July 2014 by the Bible Society. A few small publishers produce books in Cornish which are stocked in some local bookshops, as well as in Cornish branches of Waterstones and WH Smiths, although newer publications are becoming increasingly available on the Internet. The Truro Waterstones hosts the annual "Holyer an Gof" literary awards, established by Gorsedh Kernow to recognise publications relating to Cornwall or in the Cornish language. In recent years, a number of Cornish translations of literature have been published, including Alice's Adventures in Wonderland (2009), Around the World in Eighty Days (2009), Treasure Island (2010), The Railway Children (2012), Hound of the Baskervilles (2012), The War of the Worlds (2012), The Wind in the Willows (2013), Three Men in a Boat (2013), Alice in Wonderland and Through the Looking-Glass (2014), and A Christmas Carol (which won the 2012 Holyer an Gof award for Cornish Language books), as well as original Cornish literature such as Jowal Lethesow (The Lyonesse Stone) by Craig Weatherhill. Literature aimed at children is also available, such as Ple'ma Spot? (Where's Spot? ), Best Goon Brèn (The Beast of Bodmin Moor), three Topsy and Tim titles, two Tintin titles and Briallen ha'n Alyon (Briallen and the Alien), which won the 2015 Holyer an Gof award for Cornish Language books for children. In 2014 An Hobys, Nicholas Williams' translation of J.R.R. Tolkien's The Hobbit was published. Cornish television shows have included a 1982 series by Westward Television each episode containing a three-minute lesson in Cornish. An Canker-Seth, an eight episode series produced by Television South West and broadcast between June and July 1984, later on S4C from May to July 1985, and as a schools programme in 1986. Also by Television South West were two bilingual programmes on Cornish Culture called Nosweyth Lowen In 2016 Kelly's Ice Cream of Bodmin introduced a light hearted television commercial in the Cornish language and this has been repeated in 2017. English composer Peter Warlock wrote a Christmas carol in Cornish (setting words by Henry Jenner). Cornish musician Jory Bennett has composed "Six Songs of Cornwall" for bass and piano, a Cornish song-cycle, settings of Cornish language poems by Nicholas Williams /trans. E. G. Retallack Hooper (f.p. Keele University, 7 May 1986). The Cornish electronic musician Aphex Twin has used Cornish names for track titles, most notably on his DrukQs album. Attempts have been made to recreate, in order to preserve, some Cornish folk songs, including "An Awhesyth", "Bro Goth agan Tasow", and "Delkiow Sivy". In 2018, the singer Gwenno Saunders released an album in Cornish, entitled Le Kov. The Cornish language has influenced the toponomy of Cornwall, and has historically been used in surnames for the Cornish people. 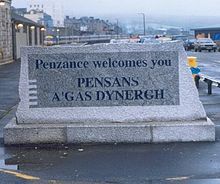 Long before the agreement of the Standard Written Form of Cornish in the 21st century, Late Cornish orthography in the Early Modern period usually followed Welsh to English transliteration so phonetically rendering C for K, I for Y, U for W, and Z for S, caused place-names such as Porthcurno and Penzance to be adopted into English instead of their Standard Written Form Porth Kernow and Pen Sans. Likewise, words such as Enys ("island") can be found spelled as "Ince" as at Ince Castle. These apparent mistranslations can however reveal an insight into how names and places were actually pronounced, explaining, for example, how anglicised Launceston is still pronounced "Lann-zan" from Cornish "Lann Stefan" (though with emphasis on the first element, the result of accent shift in English, and a consonant change s > z which again would have occurred in English in this alternative English form of the name). Ellery Elerghi Either a dialectal variant of Hilary (from Latin Hilarius), or from the parish of Elerghi, meaning "swan river". Trevithick Trevuthik Possibly "Town Doctor"
^ "Number of Welsh, Gaelic, Irish and Cornish speakers from the 2011 Census". Office of National statistics. 9 June 2017. Retrieved 2 June 2018. ^ Hammarström, Harald; Forkel, Robert; Haspelmath, Martin, eds. (2017). "Cornish". Glottolog 3.0. Jena, Germany: Max Planck Institute for the Science of Human History. 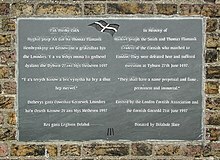 ^ "THE HISTORY OF THE CORNISH LANGUAGE". CelticLife International. CelticLife International. Retrieved 8 March 2018. ^ Parry, John (1946). "The Revival of Cornish: An Dasserghyans Kernewek". PMLA. Modern Language Association: 258. doi:10.2307/459233. JSTOR 459233. ^ "Funding boost to safeguard Cornish language announced". gov.uk. 13 March 2015. ^ "Kowethas an Yeth Kernewek wins Heritage Lottery Fund support". 19 August 2014. Archived from the original on 31 March 2016. ^ "Cornish gains official recognition". BBC News. 6 November 2002. Retrieved 11 November 2012. ^ a b c Diarmuid O'Neill. Rebuilding the Celtic Languages: Reversing Language Shift in the Celtic Countries. Y Lolfa. p. 240. ISBN 0-86243-723-7. ^ Linguistic minorities in countries belonging to the European community: summary report. Commission of the European Communities. 1986. p. 195. ^ Deacon, Bernard; Tregidga, Garry; Cole, Richard (2003). Mebyon Kernow and Cornish Nationalism. Welsh Academic Press. p. 132. ^ Kendrick, Donald (2000). Scholarship and the Gypsy Struggle : Commitment in Romani Studies: A Collection of Papers and Poems to Celebrate Donald Kenrick's Seventieth Year. University of Hertfordshire Press. p. 43. ^ Ball, Martin; Muller, Nicole (2009). The Celtic Languages. Routledge. ^ Beresford Ellis, Peter (1990). The Story of the Cornish Language. Tor Mark Press. pp. 19–25. ISBN 0-85025-371-3. ^ a b c "Cornish language no longer extinct, says UN". BBC News Online. 7 December 2010. Retrieved 11 November 2012. ^ "Cornish language – is it dead?". This is The West Country. 21 February 2009. Retrieved 11 November 2012. ^ "Have a good dy: Cornish language is taught in nursery". The Times. 15 January 2010. Archived from the original on 4 June 2010. Retrieved 11 November 2012. ^ Williams, Nicholas J. A. (2010). "The Preterite in Cornish". Cornish Studies. Second Series. 18: 201. ^ Ball, Martin J.; Fife, James (1993). The Celtic Languages. New York: Routledge. Retrieved 4 September 2016. ^ Sims-Williams, P. (Winter 2005) "A New Brittonic Gloss on Boethius: ud rocashaas", Cambrian Medieval Celtic Studies 50, 77–86. ^ a b George, Ken (1986). "How many people spoke Cornish traditionally?". Cornish Studies. 14: 67–70. ^ a b Stalmaszczyk, Piotr (1997). "Cornish Language and Literature: A brief introduction". Acta Universitatis Lodziensis. Folia Litteraria Anglica. 3 (1999): 117–127. ^ Rose-Troup, Frances (1913). The Western Rebellion of 1549. London: Smith. pp. 435–36. Retrieved 4 September 2016. ^ Mills, Jon (2010). "Genocide and Ethnocide: The Suppression of the Cornish Language" (PDF). Interfaces in Language: 189–206. doi:10.13140/2.1.1439.5843. ^ Ellis, Peter Berresford (1 January 1974). "The Cornish Language and Its Literature". Mass. – via Google Books. ^ Carew, Richard (1811). Carew's Survey of Cornwall: to which are added, notes illustrative of its history and antiquities. Printed by T. Bensley for J. Faulder. p. 152. Retrieved 13 February 2013. ^ Morris, Jonathan (19 May 2008). "Breakthrough for Cornish language". BBC News Online. Retrieved 11 November 2012. ^ "Standard Cornish spelling agreed". BBC News Online. 19 May 2008. Retrieved 11 November 2012. ^ Ferdinand, Siarl (2 December 2013). "A Brief History of the Cornish Language, its Revival and its Current Status". e-Keltoi: Journal of Interdisciplinary Celtic Studies. 2: 199–227. ISSN 1540-4889. Retrieved 11 July 2018. ^ Diarmuid O'Neill. Rebuilding the Celtic Languages: Reversing Language Shift in the Celtic Countries. Y Lolfa. p. 242. ISBN 0-86243-723-7. ^ a b "First Cornish-speaking creche is inspired by example set in Wales". WalesOnline website. Welsh Media Ltd. 16 January 2010. Retrieved 18 January 2010. ^ "Cornish language no longer extinct, says UN". 7 December 2010 – via www.bbc.com. ^ Harley, Nicola (5 November 2015). "Council splashes out £180,000 to try to stop the Cornish language dying out". The Daily Telegraph. Retrieved 1 July 2017. ^ "Language in England and Wales: 2011". Archived from the original on 29 July 2014. Retrieved 7 April 2017 – via ons.gov.uk. ^ "Celtic Revival". University of Exeter. Retrieved 3 July 2018. ^ Birch, Sophie (March 2010). "Cornwall cultural strategy evidence report" (PDF). Cornwall Council. p. 24. Retrieved 19 April 2018. ^ "Dyslexic councillor says Cornish language road signs could prove dangerous for drivers". Plymouth Herald. 21 July 2014. Archived from the original on 29 July 2014. Retrieved 29 July 2014. ^ Elgot, Jessica (7 October 2015). "Cornwall council plans to encourage staff to speak Cornish". The Guardian. ^ Milmo, Cahal (23 April 2014). "Cornish to be recognised as a national minority along with Scots, Welsh and Irish". The Independent. Retrieved 3 February 2019. ^ "Cornish language funding stopped by government". BBC News. 21 April 2016. ^ Mills, Jon. "The Vocabularium Cornicum: a Cornish vocabulary?". Zeitschrift für celtische Philologie. 60 (1). doi:10.1515/zcph.2013.009. ^ Padel, Oliver. "The nature and date of the Old Cornish Vocabulary". Zeitschrift für celtische Philologie. 61 (1). doi:10.1515/zcph.2014.009. ^ "Cornish (Kernewek/Kernowek/Kernuak/Curnoack)". Omniglot. Retrieved 4 September 2016. ^ "Business Use". Cornish Language Partnership. Retrieved 4 September 2016. ^ In a post on the blog Language Log. Retrieved 2 August 2011, linguist Geoffrey K. Pullum reported that MacKinnon was quoting an edition of Jenner that is no longer available to him (Pullum's main concern was the impact of the triple negative in the cited sentence). ^ "RanG". Radyo.kernewegva.com. Retrieved 11 November 2012. ^ Mills, J. (1 November 2000). "Linguistic Relativity and Linguistic Determinism: Idiom in 20th Century Cornish" (PDF). Retrieved 24 April 2017. ^ Stoyle, Mark (October 1999). "The Dissidence of Despair: Rebellion And Identity In Early Modern Cornwall". Journal of British Studies. 38 (4): 423–444. JSTOR 175946. ^ "Crying the Neck in Cornwall". Newquay.oldcornwall.org.uk. Archived from the original on 8 July 2012. Retrieved 11 November 2012. ^ "Bonfire". Redrutholdcornwall.org. 26 May 2012. Archived from the original on 14 November 2012. Retrieved 11 November 2012. ^ "About the Institute". Institute of Cornish Studies. University of Exeter. ^ "The Language Centre". University of Cambridge. ^ "The Department of Anglo-Saxon, Norse & Celtic". University of Cambridge. ^ "Kevren" (PDF). Maga. December 2014. Archived from the original (PDF) on 28 January 2015. Retrieved 24 January 2015. ^ "Find a Class". Learn Cornish Now. Cornish Language Office. Retrieved 11 December 2017. ^ Jago, Fred W. P. (1882) The Ancient Language and the Dialect of Cornwall. New York: AMS Press, 1983, (originally published 1882, Netherton and Worth, Truro), pp. 4 ff. ^ Sayers, Dave (2012). "Standardising Cornish: The Politics Of A New Minority Language". Language Problems and Language Planning. 36 (2): 99–119. doi:10.1075/lplp.36.2.01say. Retrieved 24 April 2017. ^ Holmes, Clive (1998). Review of Faction and Faith. Politics and Religion of the Cornish Gentry before the Civil War; Law, Order and Government in Caernarfonshire, 1558–1640 by Anne Duffin; Law, Order and Government in Caernarfonshire, 1558–1640. Justices of the Peace and the Gentry by John Gwynfor Jones. 113. The English Historical Review. pp. 177–179. JSTOR 576240. ^ "Passyon Agan Arluth". Preder.net. 22 October 2009. Retrieved 11 November 2012. ^ "Holyer an Gof Awards". Retrieved 21 January 2015. ^ "Alys in Pow an Anethow". Evertype. Retrieved 3 December 2014. ^ "Adro dhe'n Bÿs in Peswar Ugans Dëdh". Evertype. Retrieved 3 December 2014. ^ "Enys Tresour". Evertype. Retrieved 3 December 2014. ^ "Flehes an Hens Horn". Evertype. Retrieved 3 December 2014. ^ "Ky Teylu Baskerville". Evertype. Retrieved 3 December 2014. ^ "Gwerryans an Planettys". Evertype. Retrieved 3 December 2014. ^ "An Gwyns i'n Helyk". Evertype. Retrieved 3 December 2014. ^ "Tredden in Scath (Heb Gwil Mencyon a'n Ky)". Evertype. Retrieved 3 December 2014. ^ "Alys y'n Vro a Varthusyon ha Der an Gweder-Mires". Kesva an Taves Kernewek. ^ "Karol Nadelik". Kowethas an Yeth Kernewek. ^ "Jowal Lethesow". Evertype. Retrieved 3 December 2014. ^ "Topsy and Tim". Kowethas an Yeth Kernewek. ^ "Briallen ha'n Alyon". Ors Sempel. ^ "An Hobys, pò An Fordh Dy ha Tre Arta". Evertype. Retrieved 3 December 2014. ^ "An Gannas – Cornish language magazine". ^ "Cornwall – Connected – Hear the news read in Cornish". BBC. Retrieved 28 May 2013. ^ "An Canker-Seth". BroadcastForSchools.co.uk. 31 December 2011. Retrieved 28 May 2013. ^ Williams, Holly (12 April 2018). "The rebirth of Britain's 'lost' languages". BBC. Retrieved 13 April 2018. ^ "Ellery Family History". Ancestry. Retrieved 28 November 2018. ^ "Last Name: Ellery". SurnameDB. Retrieved 28 November 2018. ^ "Trevithick Family History". Ancestry. Retrieved 28 November 2018.